The precinct is bounded on the north by Division street, on the south by the Chicago river, on the east by Lake Michigan and on the west by the North branch of the Chicago river to the North branch canal, thence along North branch canal to Division street. Area one and one-fourth square miles, population 54,500. The historic Chicago av. police station at 113 W. Chicago av., a three story stone structure built in 1891 and Chicago’s oldest police building, was closed at 12:01 a. m. today when the district headquarters was moved to the second floor of the new central office building at 325 N. La Salle st. The station has been dying by sections. The antiquated Chicago av. police court on the second floor, with its warped planks and park benches for lawyers and spectators, was closed in 1951. Also abandoned that year were the dreary basement cells where some of Chicago’s most desperate criminals have peered thru the bars. After that closing policemen and prisoners for a time continued to wear deeper the hollows in the stone steps of the station in moving the offenders to cells space and court in the Racine av. police station. The first Chicago av. police station was a wooden structure opened in 1875. In 1877 a justice court was opened to take care of bicycle riders exceeding the speed limit. One of the first branches of Municipal court was established there shortly after the passing of the Municipal court act in 1906. The court was closed in 1934 after a judge complained he found “bugs” on the courtroom floors and on his bench and chair. Huge cats, used to catch rats and mice attracted to the basement dungeons, often interrupted court hearings by meowing. But a year later, after the building was refurbished, the court was reopened. The people who have come into the station have been as varied as the district. Its east end is the gold coast, its west end the slums. There are low cost public, housing projects and high cost apartment buildings, fine hotels and shabby warehouses, honky tonks and swank restaurants, and famous universities and hospitals in the area. The station has had more than its share of big cases. Gangster Dion O’Banion was shot and killed two blocks away. The largest case file to be moved from the old station is that of the unsolved murder of Mrs. Adele B. Williams, fatally shot in her room in the Drake hotel in 1944 by a woman dressed in black. Capt. Thomas Harrison, commander of the district, who has worked 12 years in the decrepit station in varying periods since 1932, is on furlough and was not around to help supervise the closing. 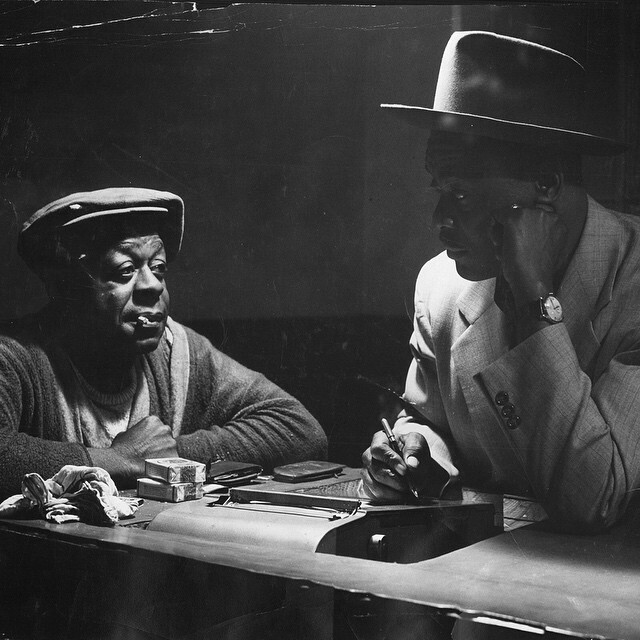 In the darkened basement of the Chicago Avenue police station, 113 W. Chicago, Detective Dan Jackson (right) takes personal data from a man held on suspicion of running policy slips. The prisoner’s belongings are laid out before him. He’ll keep the cigarettes, but the rest goes unto the safe until the case is closed. Plans are almost completed for the construction of new police stations for the East Chicago avenue and Racine avenue districts, City Architect Paul Gerhardt said yesterday. The new, two story stations will have police quarters and lockups on the first floors and courtrooms and quarters for juvenile squads and other specialized units on the second floors. There will be no basements. Gerhardt said the city will advertise for bids on the East Chicago avenue station in a few weeks and on the Racine avenue station about Sept. 15. The buildings will cost approximately $400,000 each and are expected to be completed by the end of 1959. The East Chicago avenue station will be built at 113 W. Chicago av. 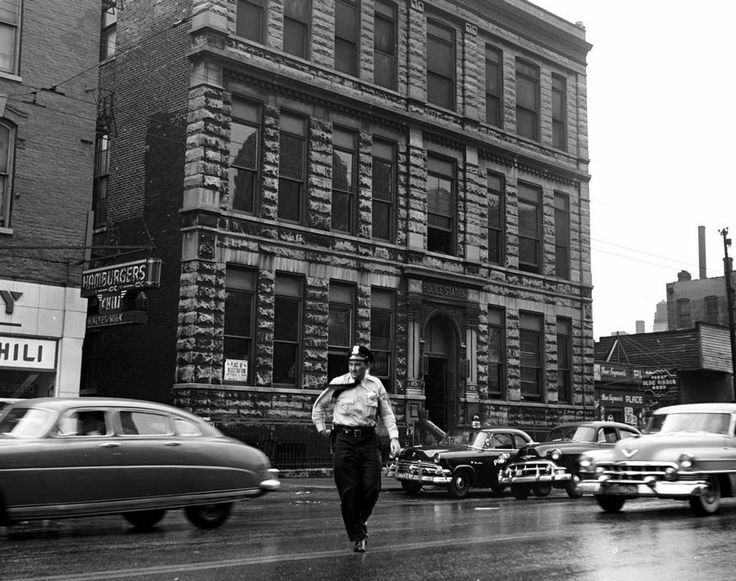 on the site of its predecessor which was abandoned Oct. 1, 1956, and torn down last year. Construction of the new building will mean that the men who police the near north side will return to a headquarters in the bright lights area after a sojourn in temporary quarters in the city s central office building, 321 N. Clark st.
At the time the former station was abandoned, it was Chicago’s oldest police building, built in 1891—famous for its variety of cases, decrepit appearance, and dreary basement cells. However, it was beloved by most of its policemen, including the present commander, Capt. Thomas Harrison, who worked there 12 years in varying periods. Both new police stations will have parking areas to accommodate police vehicles and persons going to court. The East Chicago avenue station area will extend south to Superior street. The present Racine avenue station, at 731 W. Racine, is to be torn down because it stands in the way of the Northwest superhighway. The new structure will be erected at the northeast corner of Walton and Wood streets. NOTES: 1 Before 1909, the East/West division line was the Chicago River. Streets that cross the Chicago River had the prefix N (for North of the River), and W (for West of the River), but the prefix of S or E was seldom used. Thus, the correct names are Erie and W. Erie, Lake and W. Lake, Clark and N. Clark, etc. 1906 Annual Chicago Police Report.